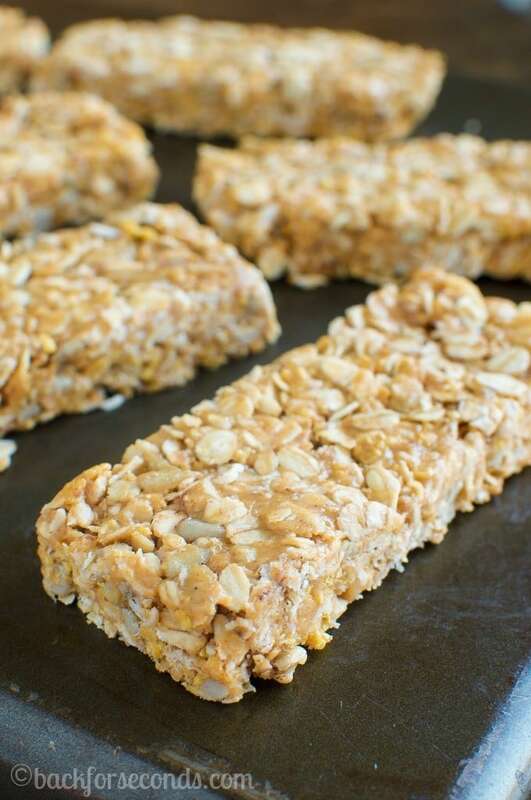 These Chewy Peanut Butter and Honey Granola Bars are the BEST! So easy to make with just 5 ingredients. They are no bake and ready to eat in 10 minutes! In a large bow,l stir together the peanut butter and honey. Add in remaining ingredients and stir to combine. Press mixture firmly into a 9x13" pan. Cut into bars. Wrap individually or cover and store tightly at room temperature. What a great midday snack! Love it! Homemade granola bars are a staple in my house because my boys go through them like mad! Since this recipe is easy enough, I like the idea that my can make them themselves. These look perfect! Peanut butter and honey are among my favorite flavor combinations — don’t think they need anything else! Those look perfect and such a great, wholesome ingredients list – can’t wait to try them! These are great snacks for everyone! I followed the recipe the first time I made them but the second time I decreased the honey to just 1/2 cup and you can’t tell a difference. Definitely a keeper! Thanks! Yummy! These look so good.. I’m making them and can’t wait to try them!